Movement Is For Every Body is a two-part exhibition showcasing movement, dance, and accessibility which challenges the way one is usually supposed to move in an art gallery and explores questions like: Who gets to call themselves a dancer? What’s dance and what’s movement? Is there a difference? Working with a professional dancer (Lily Cryan, our Program Coordinator) and visual artist (Kay Slater, our Gallery Preparator) to make our schemes for the gallery a reality was a privilege and an inspiration. As an artist who works with words rather than movement or illustration, I learned so much from both my coworkers—especially when it came to hands-on visual arts tasks like installing a whiteboard wall, selecting a colour scheme, and ensuring that all our art was hung at the right height so that it could be accessible to an adult in a wheelchair. Three artist-heads are absolutely better than one! “We wanted to avoid stereotypes but still make recognizable body figures. 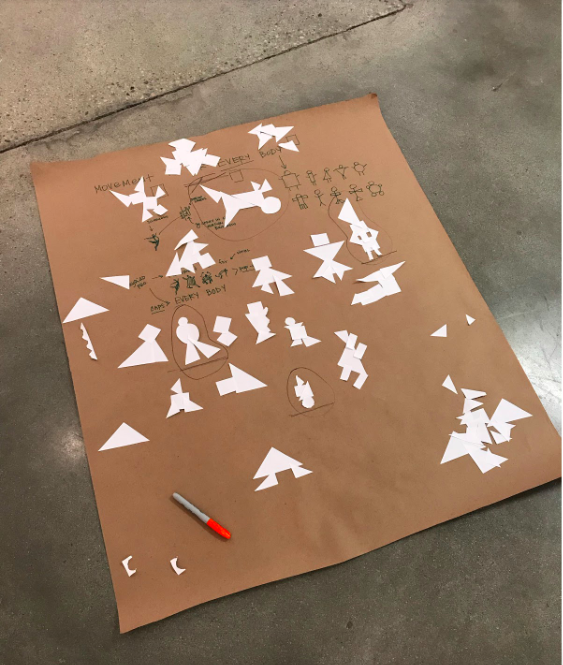 We prepared a few different shapes in different sizes, took a quiet few minutes pieces and placing shapes, a few minutes more to regard the figures that had quickly and naturally emerged. We exchanged our thoughts and a favourite four easily rose to the top." You can find our four figures hidden all throughout the gallery! This was your first time curating a gallery exhibition for ArtStarts. What were some moments during the creation of the exhibit where you had to remind yourself to "trust the process"? I was grateful to be able to trust my two new coworkers as part of the process! It’s been a long time since I picked up a paintbrush of any kind, and while I’ve done museum-based exhibit strike and installation many times, it’s different working with a white box that you can really transform to make the exhibition stand out! I’m also grateful to our incredible team of volunteers, who devoted time and energy to everything from making sure our cyborg’s brain lit up properly to laying out gym tape (so...much...gym...tape) on the floor to make sure that visitors are encouraged to move through the space in unconventional ways. Is this exhibit truly for every body? How could someone in a wheelchair or is blind participate? Yes! This exhibition encourages art on the move! Visitors are encouraged to follow a series of dotted lines throughout the space—but to follow them in their own way. All bodies can follow all the lines, but may do so in different ways. We always ask visitors to be respectful of their neighbours’ personal space and the artwork while moving throughout the Gallery. All bodies are good bodies! ArtStarts is a wheelchair accessible space equipped with a lift and accessible, gender-neutral washrooms. We also can now provide ASL interpretation for our events and tours by request. How do you choose the projects that go into the exhibit? What do you look for? When Lily and I look through our successful Artists in the Classroom grant projects, we’re excited about projects that have potential for unconventional, process-based installation in the gallery. Whether that’s highlighting silkscreens from grade four students at Pierre Trudeau Elementary (just a slice of the finished mural that the entire school collaborated to install outside their art studio with the guidance of Maggie Milne Martens), or displaying an artists’ blog documenting the production of a grade six/seven dance project about the Beatles (Lisa Sars, The Living Room Project), we’re interested in projects where we can highlight the process rather than a polished product. We’re also on the lookout for projects that integrate the arts on multiple levels—like Humans of the Future, created by grade 8 students in an Inquiry Studies program at Guildford Park Secondary. Students studied Mary Wollstonecraft Shelley’s Frankenstein as the inspiration to create two life-size human bodies using a STEAM (science, technology, engineering, art and mathematics) approach. After receiving a tour of New Westminster’s New Media Gallery exhibition CORPUS, which explored ideas around the human body of the future, students worked with professional artist Hannamari Jalovaara on their own interpretations which have since been showcased at the New Media Gallery and here at ArtStarts. What would you say to a potential visitor who says, "I love to watch dance but I could never do it! My body doesn't move like that”? We recently brought in a friend of ArtStarts, Naomi Brand of All Bodies Dance, for a workshop with teachers on this very subject! We’re also learning a lot from our in-house professional dancer and Program Coordinator, Lily Cryan, about ways to complicate our own beliefs around what is and isn’t dance. 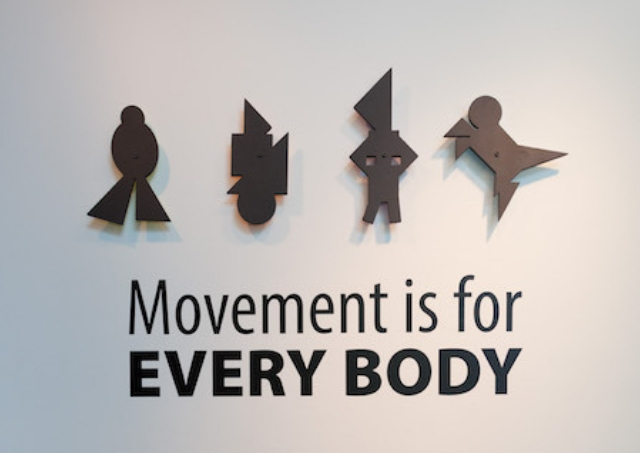 This exhibit will reinforce and affirm our belief that dance is for every body. In the same way that ArtStarts talks about creativity as something that everyone has whether or not you "can draw," movement is a language that everyone can use creatively whether or not you "can dance." All kinds of movements from all kinds of bodies are good! What were some contributing factors that led to the inspiration of this theme? Why is this theme important to you? Lily and I were thrilled to develop this theme together because of our shared hope that focusing on bodies and movement in a traditional gallery space where kids are usually supposed to stand still, behave, look, and not touch would be transformative! We also feel strongly that dance and movement have the potential to instill bodily autonomy, positive self-image, confidence, and awareness—critical qualities for young people, especially girls, students of colour, students with disabilities, and young LGBTQ students. So many cultures have long-standing dance traditions, but dance remains one of the most expensive, stigmatized, inaccessible, and traditionally Eurocentric art forms in the West. In the world ArtStarts dreams of, everyone would have access to expression through movement! We know that movement and dance are loaded, challenging, and often embarrassing subjects for teachers—ArtStarts is ready to support teachers to deliver dance-related programming! We’ve developed pre- and post-lesson plans for teachers who bring their classes to the gallery, and are working on innovative virtual programming that can be delivered across the province to really meet teachers & learners where they’re at. Working in a dance tradition and considering the body in educational contexts is a big part of 21st century learning environments; this exhibit provides teachers with the tools to start taking on and doing that transformational work. We hope teachers will plan a visit for phase two of this exhibit, where we’re transforming our gallery into a pop-up dance studio—no experience required! Explore life-size projections of dancers and diverse techniques, see yourself on the big screen as we showcase our crowdsourced video (or follow along with the movements! ), try your hand at accompanying a dancer with music, and explore movement in new ways.Phase two of Movement is for Every Body will run from October 2018 until March 2019. Looking for a space to develop your own movement-based work or to rehearse? This project is a community activation! Get in touch to learn how you can bring your work into the space and become part of this innovative two-part exhibit.